Inspired by conversations on the FOOD52 Hotline, we're sharing tips and tricks that make navigating all of our kitchens easier and more fun. 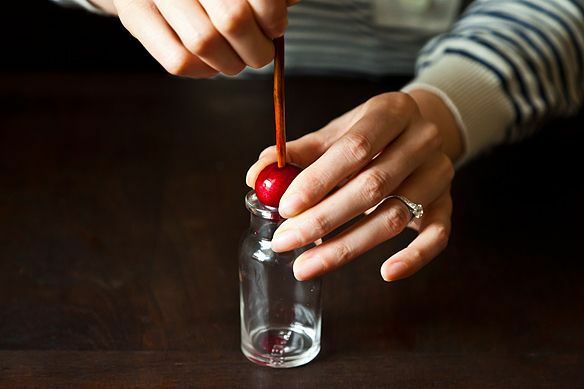 Today, we're showing you how to pit cherries without a cherry pitter. It's cherry season! Time for cherry pie, a clafoutis, or a few boozy sour cherries garnishing a cocktail. All of those things are great if you happen to have a cherry pitter but if you don't, you're in for a bit of work that results in stained hands. Sure, a pitter is an easy accessory to pick up but not everyone likes to buy single-purpose kitchen tools. And why bother when you can easily hack one? 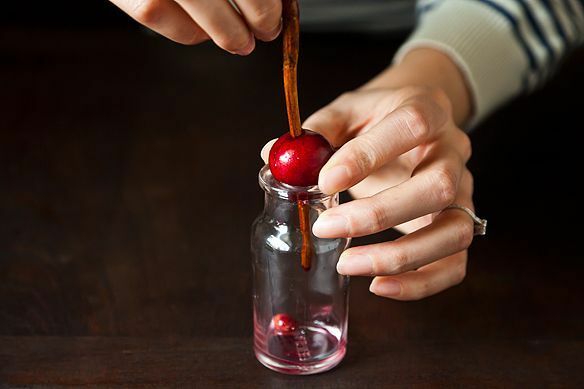 Today we're sharing an easy and gadget-free way to hack a cherry pitter. 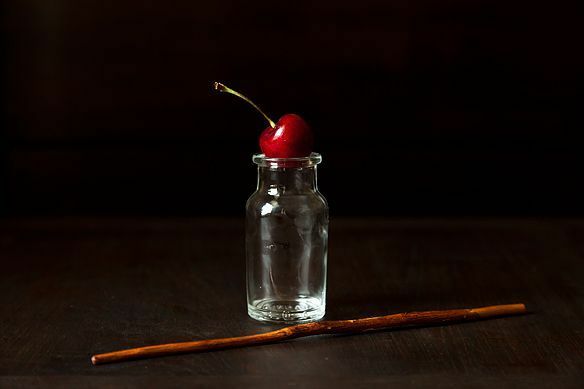 If you've got an empty beer bottle and a chop stick, you can pit a cherry. All you need is an empty bottle with a small mouth. A beer bottle is perfect -- we're just using this little cutie because, well, it's cute. Gently hold the cherry and press the chop stick through it to push the pit out the other side. The bottle collects the pits, keeping the whole process nice and neat. And there you have it. Who needs a cherry pitter anyway? 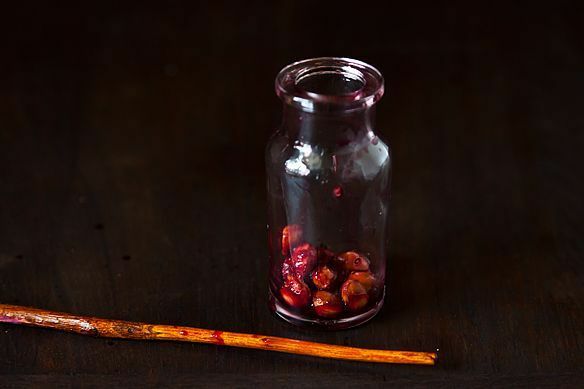 If you've got any other gadget-free tricks for pitting cherries, share them with us in the comments! I have four sour cherry trees so I have to pit ALL OF THE CHERRIES. I hate it. The easiest and best method I've found is to use a drink straw (like you would get at a fast food restaurant), cut the straw in half, and come from the "top" where the stem was straight through to the bottom into a bowl. This method works really well and I don't have to spend any money on a fancy cherry pitter. I used this today for big sweet cherries. The skin was so thick it didn't work very well. Finally, I found to "poke" a hole through both sides of the skin first. Then it worked great, and went very fast. I haven't tried this yet on tart cherries. I assume for those, it will work great. A cherry pitter is one of very few gadgets I have. What you have made is a tidy cherry pitter—yes, it's cute and clean. So is mine. Tried this with a kombucha growler, whose opening was apparently too big. Ended up with a cherry stuck in a bottle, pit and all. Whoops. That's brilliant. I have a terrific cherry pitter but I love this idea. Have to file this away for future reference. My husband and I usually pick, pit, and freeze about 20 pounds of sour cherries on the first day the season opens ... and of course make a pie. It's a marathon. We've found that using a pencil with the eraser removed does a good job on removing the pits, the metal band and the cherry pits' pointy little butts are a good match. Haven't tried doing this over a bottle but it makes good sense to make the mess a little less. Every year my mother made sour cherry jam and froze cherries for pie. She and my father would pick the cherries and my cousin and I would pit the cherries. She paid us a nickel for every hundred cherries we pitted. In my family we always use hairpins (not bobby pins, but the thinner, more flexible hairpins that you use to secure your bun). You kind of hold it in your hand between the thumb and middle finger, with the index finger between the two prongs of the pin. Put the loop this forms through the stem end, hook the pit, and pull it out all neat-like. Works great on pie cherries, which we freeze by the bucketful! I'll third the paper-clip method: works on any tiny stone, including olives. Here's how: unbend the paper clip until it looks like a flat S. Insert the curve of whichever side is sized appropriately into the area near the stem. 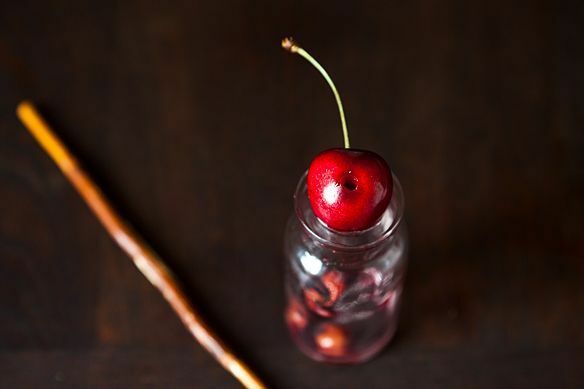 Push it past the pit (a little more than halfway into the cherry or olive,) twist it so you "catch" the pit in the curve of your safety pin, and pull the pit up through the hole in the stem. 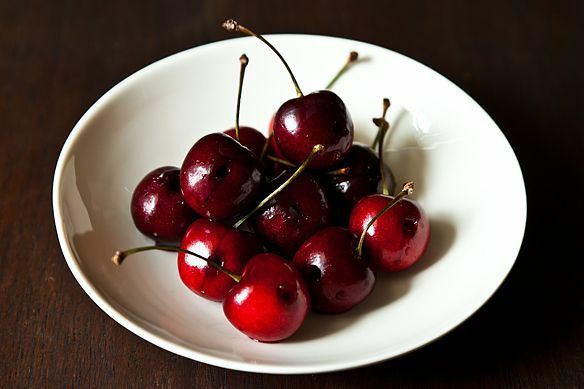 Sour cherries are much smaller in diameter than the sweet cherries pictured, and would probably get pushed down into a beer bottle by the force of pressing the chopstick. As long as you have to pit each cherry individually, the paper clip method works as well as anything. But when you are pitting large quantities of cherries--like I do every year to make preserves, investing in a less labor-intensive tool makes sense. I bought a [url="http://www.chefscatalog.com/product/93600-leifheit-cherry-stoner.aspx?utm_source=shopping&utm_medium=shopping&utm_content=93600&utm_campaign=Leifheit%20International%20USA&sourcecode=CW4CS4007&gdftrk=gdfV23800_a_7c2214_a_7c9323_a_7c10094"]Leifheit cherry pitter[/url], and though you have to eyeball each cherry to make certain the pit wasn't retained, which happens regularly, it does save considerable time. A pitter that does four cherries simultaneously does sound intriguing. Great idea! Also fun to read about all the innovative ways people have devised for doing this task. I used to smash cherries with the side of a knife to get the pits out, kind of like smashing garlic to get the skins off. It worked well, but I ended up with cherry juice stains everywhere. I have a cherry pitter now, which does 4 cherries @ once. I do love it, even though I use it only once a year. I find it easy to pit sour cherries by hand, and they leave no stain. It takes about one news broadcast to pit three pounds. What's a three pronged potato fork? I actually do have a cherry pitter but it doesn't work well with sour cherries or these kind of amazing cherries I've been getting at our farm stand called "pie cherries" they taste like pie, they are samll and pretty soft...have a quart at home I've been eyeing trying to figure out the best way to pit them so they were still pretty (they are goregeous they look just like cherryhead sour candies) trogolodyte that I am I often resot to either squishing them under my knife or squeezing teh pit out with my fingers... the chopstick method seems much more gentile, and I do have a cute little bottle that once held anchovies.